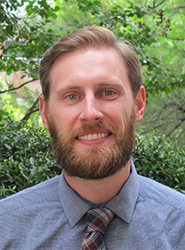 Harrison Meadows is an Assistant Professor in the Department of Modern Foreign Languages and Literatures with a specialization in early modern Hispanic literature. He completed doctoral studies at the University of Colorado Boulder. His research focuses on early modern Iberian theater with a particular focus on the ideological function of cultural production and the role played by Spanish authors in the intellectual history of the West during the sixteenth and seventeenth centuries. These interests have generated current projects on representations of wildness in the cultural imagination of Renaissance and Baroque Spain. Collaborating with co-editor John Slater (Univ. of Caifornia, Davis), he also has a forthcoming edition of two dramatic works by playwright Pedro Calderón de la Barca (titled, En la vida todo es verdad y todo mentira and Sueños hay que verdad son) that is in press with LinguaText. Dr. Meadows has taught Spanish language, literature, and culture courses at both the undergraduate and graduate levels. Most recently these include Spanish conversation courses, a graduate-level survey of seventeenth-century Iberian literature, along with a special topics course he designed on the representation of monsters on the early modern Spanish stage. His courses seek to explore topics from interdisciplinary perspectives in order to reach students of diverse interests and guide them to think critically about questions related to their specific field of study, while productively engaging the perspectives of their fellow classmates in a collaborative learning environment. For more information, please visit Harrison Meadows’ website @ http://www.earlymodernscholar.com/hmeadows-home.html. Calderón de la Barca, Pedro. En la vida todo es verdad y todo mentira, Sueños hay que verdad son. John Slater and Harrison Meadows, eds. Newark: European Masterpieces, 2016. Cervantes & Co. 78.
Review of The Man Who Invented Fiction: How Cervantes Ushered in the Modern World, by William Egginton. eHumanista 34 (2016): 576-580.